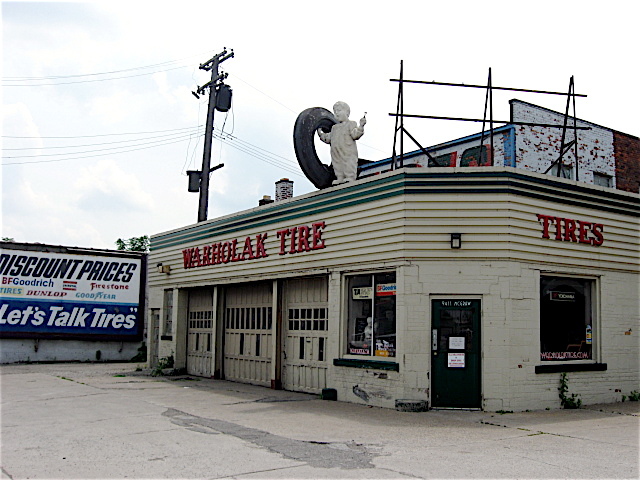 There is a pretty cool tire store on Detroit’s west side, and from what I understand it’s been in business since the early 1930s. 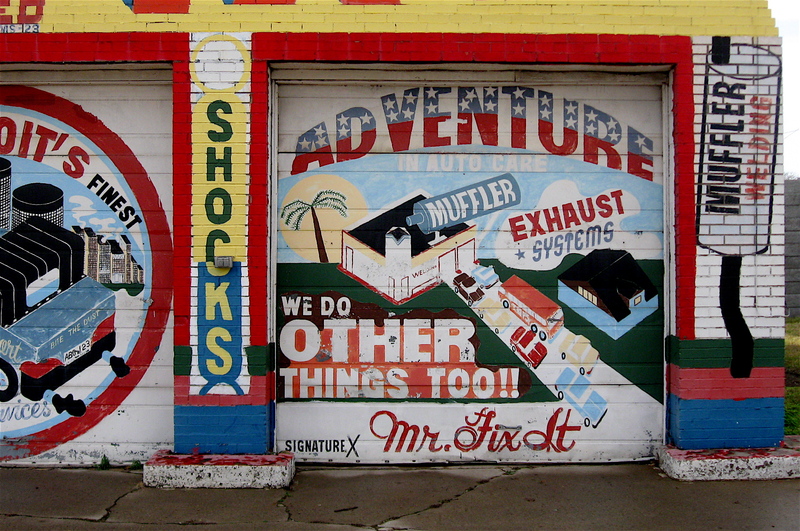 The decades-old shop is housed in a one story repair/garage facility. 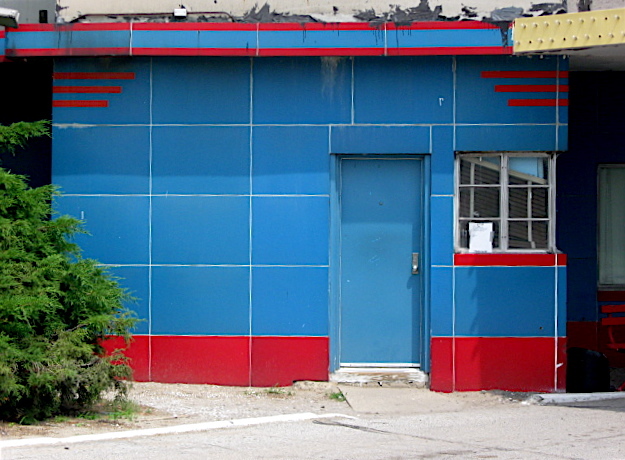 The old building has classic Art Deco features, such as the semi-curved corners and rich colors from the period that wrap around the building. I didn’t pay much attention to the place as I rode by until I saw a unique statue mounted on the roof. What caught my eye that day was a sculpture or statue of a young boy holding a candle in his left hand with an old tire held high in his right hand. He was perched on the edge of the one-story building, overlooking the parking lot. The boy was wearing what appeared to be one-piece sleeper pajamas and had an expression on his face that looked as if he was singing or yawning. After a little research, I discovered the statue is from the Fisk Tire Company and it is called “The Fisk Tire Boy”. 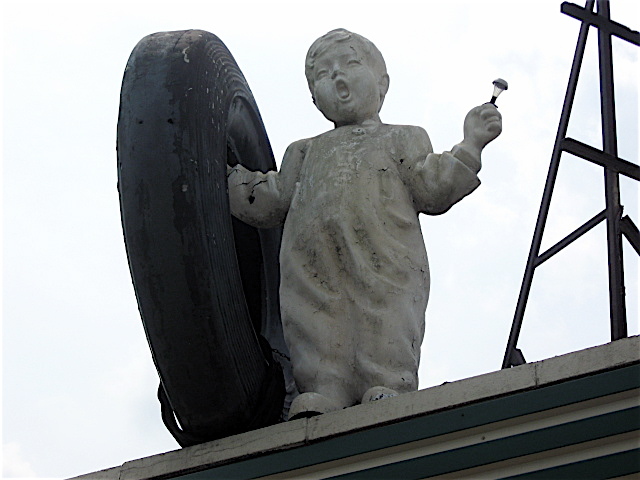 The Fisk Tire Boy was designed and rolled out to auto tire dealers in the 1920s as a brand advertising piece. 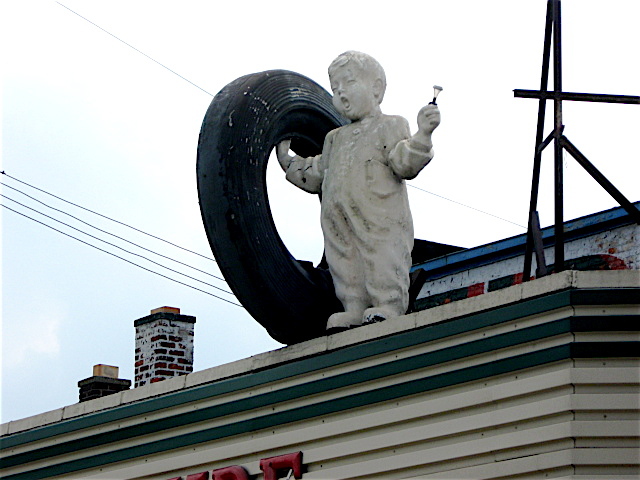 Based on its immense popularity with the tire dealers (and the general public), the yawing boy became Fisk’s official trademark and was used in various advertising and promotional pieces. The tag line used for this little guy was called, “Time to Re-Tire”. Interestingly, I spotted this vintage rooftop statue while on a bicycle ride. I later learned that the Fisk Tire Company originally produced rubber tires for bicycles in the late 1800s. 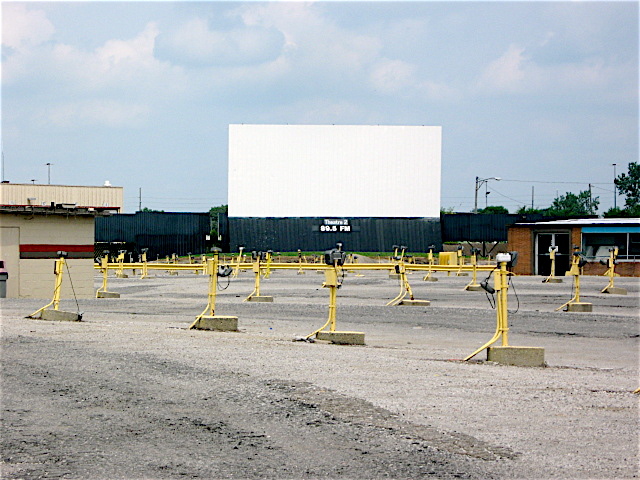 Remember the drive-in theater? The outdoor movie venues seemed to be everywhere at one time, from small town America to the country’s largest cities. Surprisingly, the country’s largest is located on the corner of Ford Road and Wyoming. 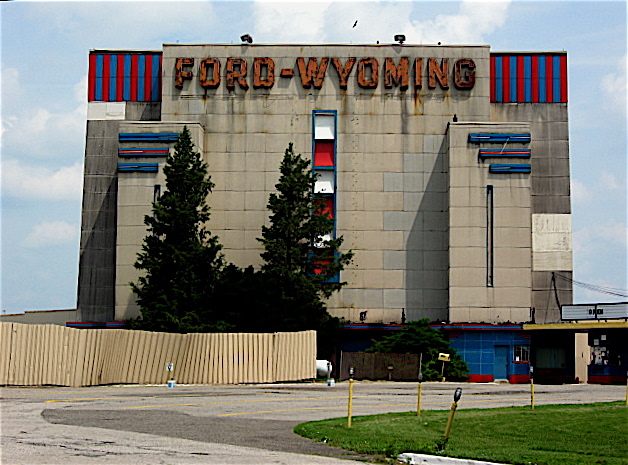 The theater, appropriately named Ford-Wyoming, opened in 1950 with one large screen and is still going strong. Today it sits on a large piece of land that incorporates five screens. It can accommodate about 2,500 cars. 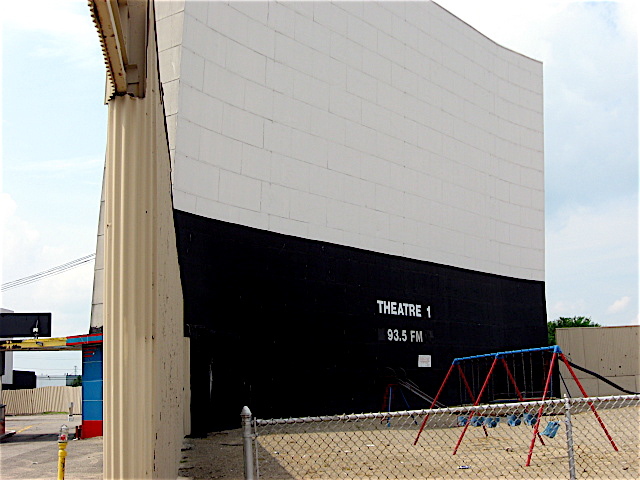 At its peak, the outdoor theater had nine screens, each showing two feature-length films. I recently rode by bike throughout the old place. What struck me right away was the enormity of the site and the architectural style of the main screen. 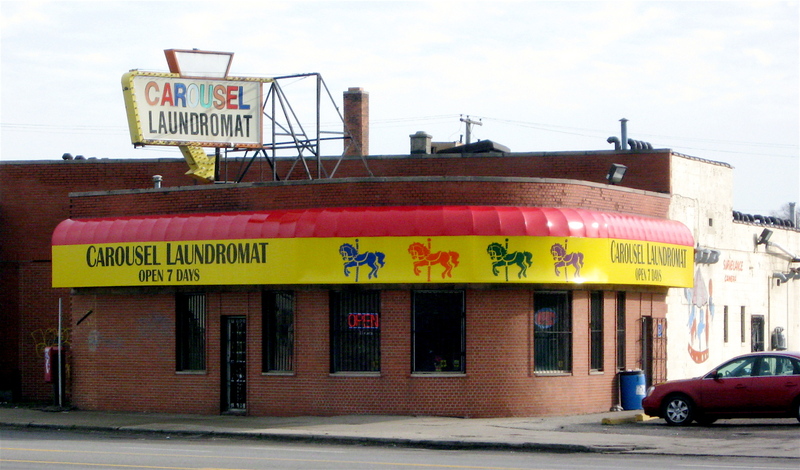 It is designed in the Art-Deco style of the mid-century and features giant bold letters that face Ford Road. The associated buildings connected to the main screen structure and three free-standing toll booths are painted in vivid blue and red. They match the Deco trim elements found on the backside of the tall screen that can be seen from Ford Road. 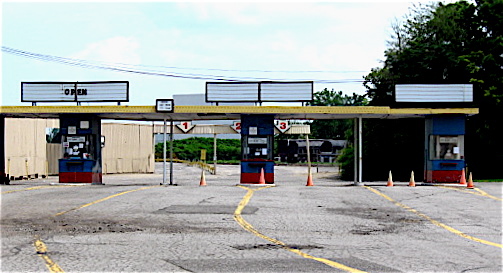 The long entrance off Ford Road leads to the ticket booths that reminded me of something you’d see at a U.S. border crossing. 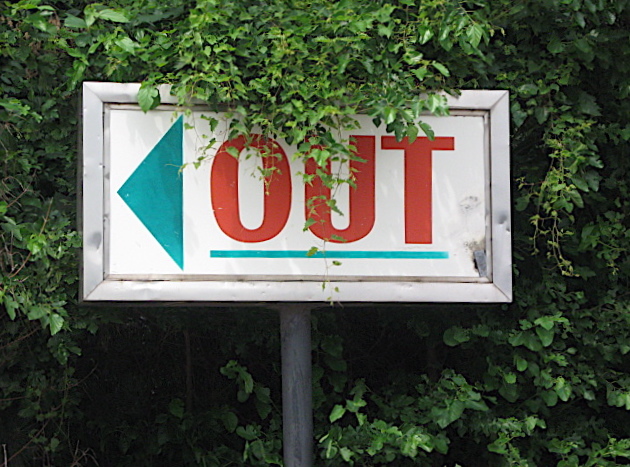 Beyond them there are directional signs pointing attendees to the right outdoor theater. They all have movie titles listed. I rode into the number two screen area, and one of the first things I noticed inside the fenced off section was the vast parking area in front of the screen and the acres upon acres of speaker poles. They seemed to spread across the open landscape like cactus plants in the arid Southwest. The actual movie screens are huge. They probably stand at least three-stories tall and are just as wide. The supporting steel structure that holds them up reminded me of something found in an industrial complex. One of the sections I was in had a central concession stand, and there is a children’s playground in front of the screen. 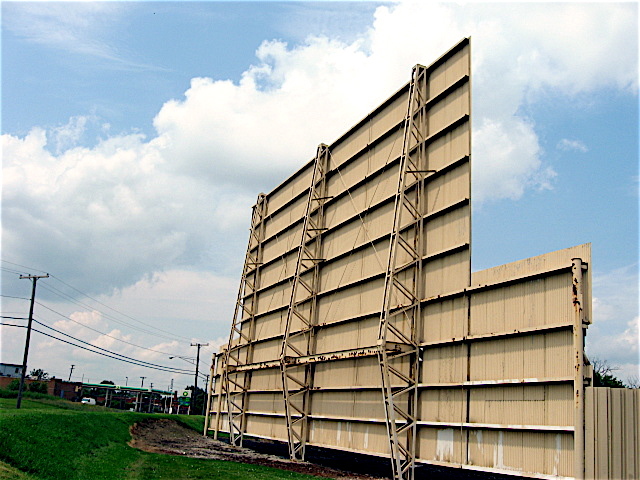 As indoor movie theater’s screens grew larger and Dolby sound came into vogue, most of the old drive-in theaters have slowly faded away. VCRs and cable TV also added to their decline. That technology brought movies right into the family living room, gluing people to their couches in front of the television. 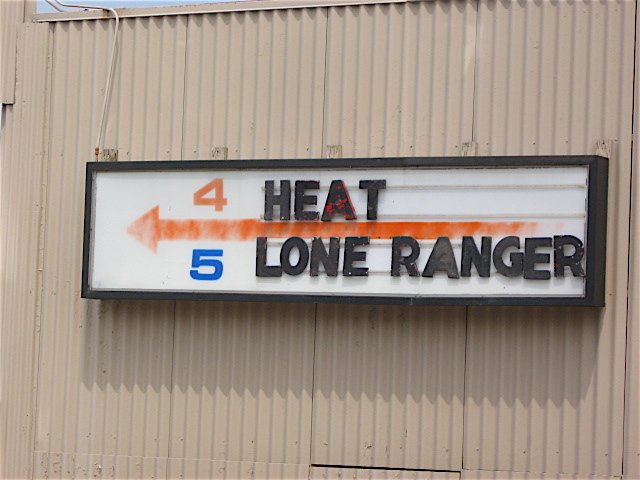 Despite the advances in technology, it’s great to see that this icon of the past is still operating and showing double-feature films year-round. 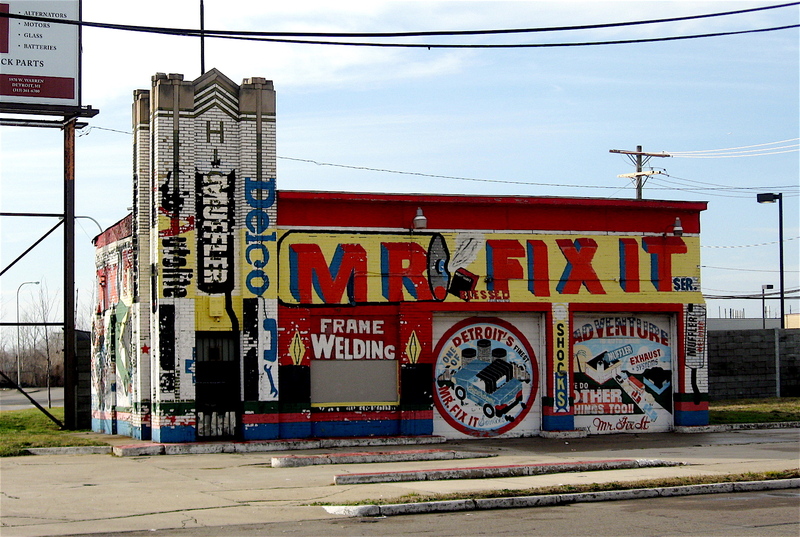 In case you missed it, this past Saturday was a good day to be out bicycling in Detroit. The roads and streets were dry. Snow and ice were long gone, and traffic was light. Best of all, it was near 60 degrees! Temperatures that warm are quite unusual in Detroit for the second weekend in January, so why not take advantage of it and spend time checking out the city on a bicycle? That’s exactly what I did. My leisurely ride began near the Historic Woodbridge neighborhood at the corner of West Warren Avenue and Trumbull Street, where I rode west on Warren to the Dearborn city limit. That is a distance of about 4-miles. The Woodbridge District has hundreds of late 1800s and early 1900s Victorian homes, and most have been restored. The compact historic community is about four blocks wide, beginning at Trumbull, spreading west to Grand River Avenue. Beyond that, there isn’t much residential property along West Warren. Woodbridge neighborhood near Trumbull St. and West Warren Ave. Typical of the many major commercial streets I’ve bicycled on in Detroit, there is plenty of open land along West Warren. The landscape out there is peppered with colorful painted buildings that house a variety of businesses. 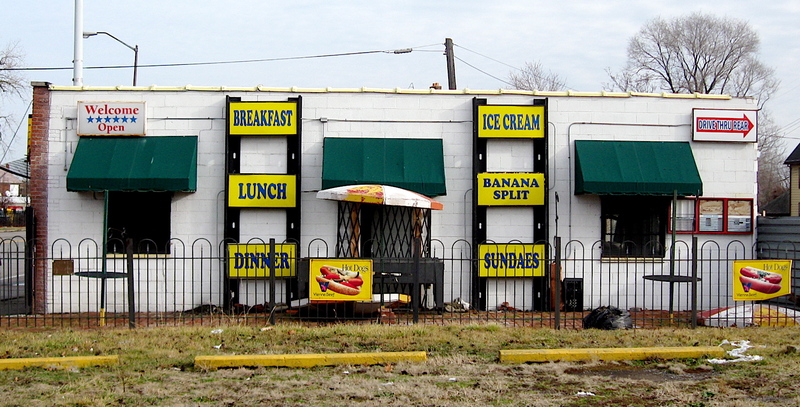 They include such places as auto repair shops, hand car washes, small Coney island restaurants and various bar-b-que joints. There is also a fair amount of vacant buildings along the avenue. Crossing in Dearborn at Wyoming Ave. was like entering a new world. There I was greeted with a bunch of fast food chains, banks, and small bustling strip centers housing national retail stores. Quite a contrast to what I saw along West Warren in Detroit. From Dearborn I rode south on Central Avenue to John Kronk Street. 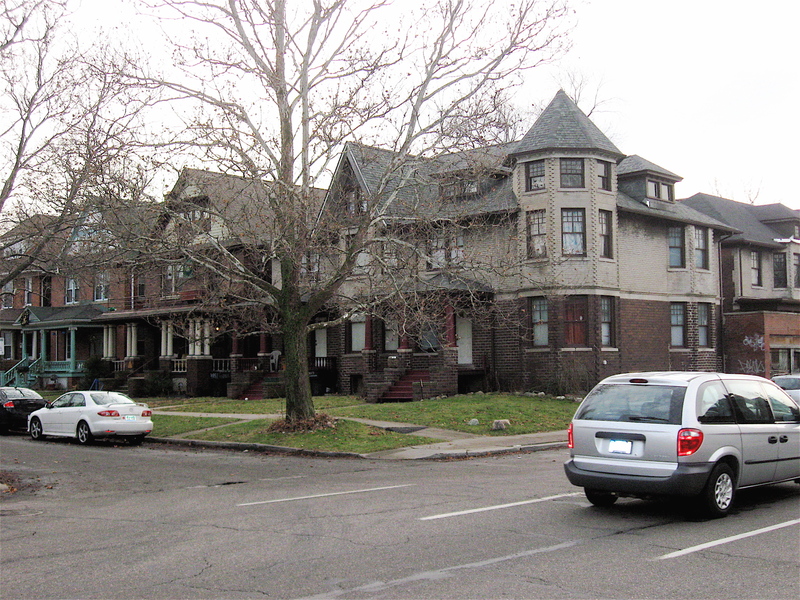 Central is a tight, narrow street in Southwest Detroit that is lined with old frame homes. Riding along that well-worn street, I saw plenty of people outside taking advantage of the high temps by cleaning up their yards, enjoying cold beers and a neighborly conversation on their front porches, or working on their cars in the street. At John Kronk I headed east along the street. That section of John Kronk hugs an expansive rail road yard that lines the road. 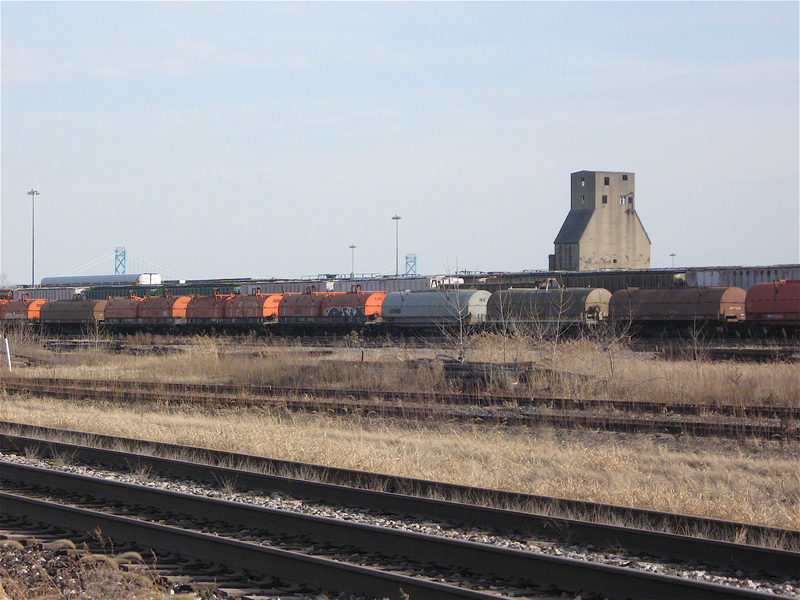 The yard was packed solid with hundreds of freight cars. Some were moving slowly and banging into each other as massive engines pushed them slowly along. From Kronk, I cut over to West Vernor Highway, a street that runs through the heart of the City’s active Mexican community. I pedaled east on Vernor to the abandoned Michigan Central Train Station, and from there I took a quick loop through Detroit’s oldest neighborhood – Corktown. I eventually ended up in downtown Detroit where I saw many bicyclists and people out meandering along, savoring the warmth. Even the skaters at the Campus Martius rink were enjoying the exceptional warm weather while skating without their heavy winter garb. Warm January days don’t happen often in Detroit. When they do, it’s always a bonus to get out and rack up a few miles on a bicycle. Remember, you can click on any picture to view them larger.